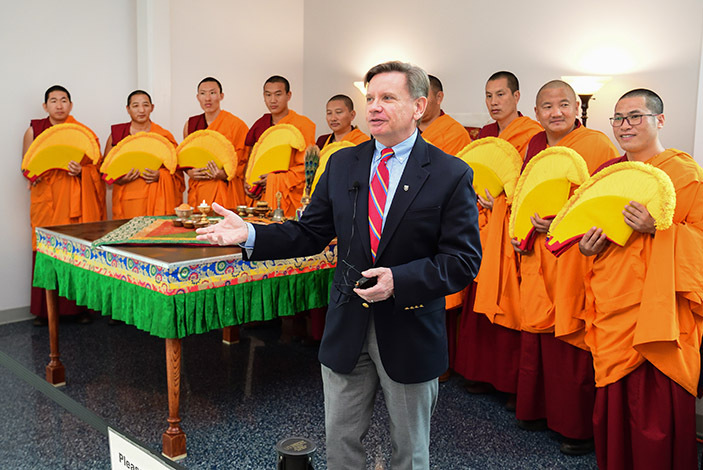 George Grant, executive director of Emory Healthcare Spiritual Health, speaks to a crowd of onlookers before the monks from the Drepung Loseling Monastery begin creating a sand mandala. The monks performed an opening ceremony with chanting, believed to generate energies conducive to healing. A steady hand is crucial when creating this special artwork. 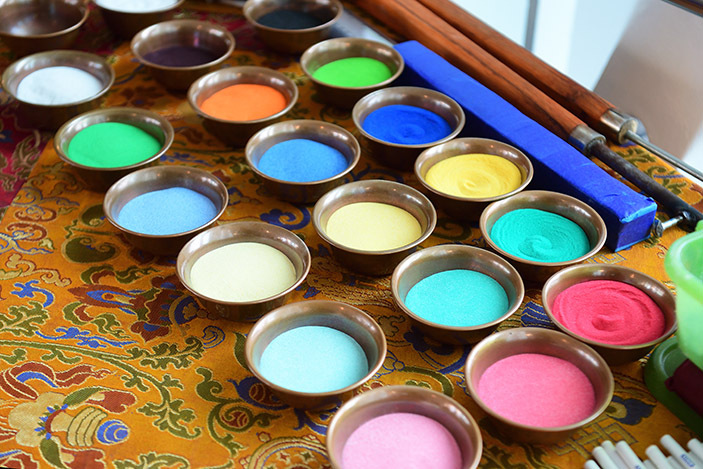 This ancient Tibetan-Buddhist tradition involves the use of colored sand to create a graphic depiction of the universe. A sand mandala, emphasizing the role of compassion and healing, was chosen for the Emory Healthcare event. With a deep focus on compassion, inspired by that of Tibetan monks from the Drepung Loseling Monastery in South India, Emory introduces a new initiative called Compassion-Centered Spiritual Health or CCSH. The CCSH concept is built upon coping techniques and methods of healing during stressful times. CBCT is a system of contemplative exercises designed to strengthen and sustain compassion. Practices include training in attentional stability and increased emotional awareness, as well as targeted analytical reflections to understand better one’s relationship with self and others. The exercises seek insights into the way a person’s mindsets and attitudes can be shifted to support personal resiliency, to foster an inclusive and more accurate understanding of others and ultimately to intensify altruistic motivation. The CCSH-joint initiative is the work of Emory Healthcare Spiritual Health and the Center for Contemplative Science and Compassion-Based Ethics at Emory University, a center that supports a research-based approach to educating both heart and mind. 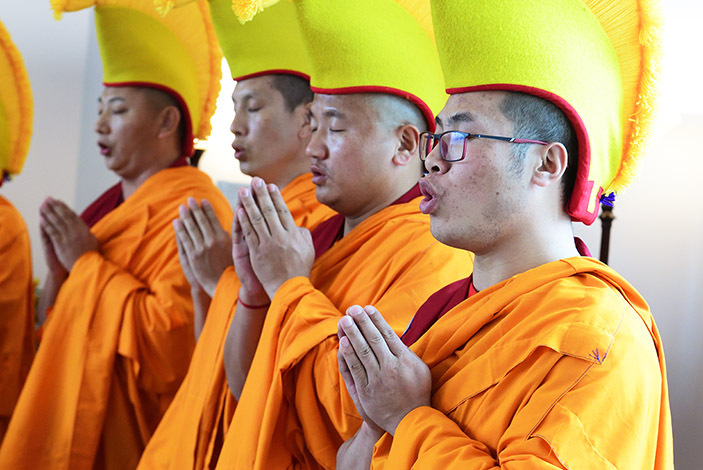 Emory has had a connection with the monks from the Drepung Loseling Monastery since 1999. Called the Emory-Tibet Partnership, the unique educational endeavor brings together the best of the Western and Tibetan Buddhist intellectual traditions for their mutual enrichment and for the discovery of new knowledge. 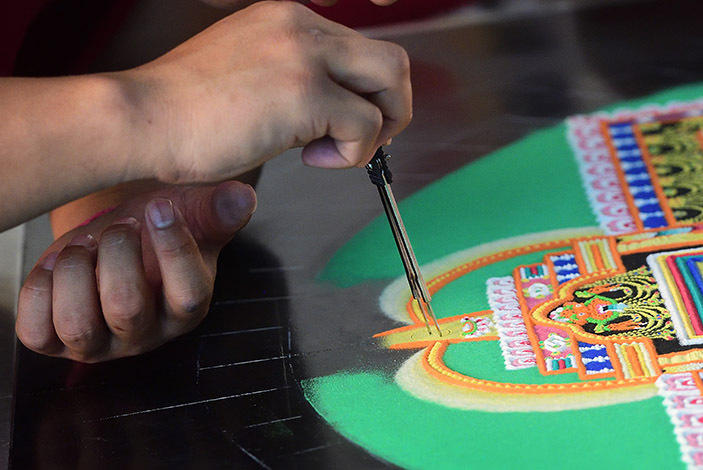 Last month, Emory Healthcare staff, visitors, patients and physicians embraced ancient culture as more than a dozen monks created a sand mandala at Emory University Hospital. The ancient Tibetan-Buddhist tradition involves the use of colored sand to create a graphic depiction of the universe, and in this case, a mandala emphasizing the role of compassion and healing was chosen. Before the monks began work, they performed an opening ceremony with chanting, believed to generate energies conducive to healing. Emory Healthcare’s Spiritual Health department and the Center for Contemplative Science and Compassion-Based Ethics at Emory organized the event and welcomed the monks to the hospital, where they spent a week creating the sand mandala. 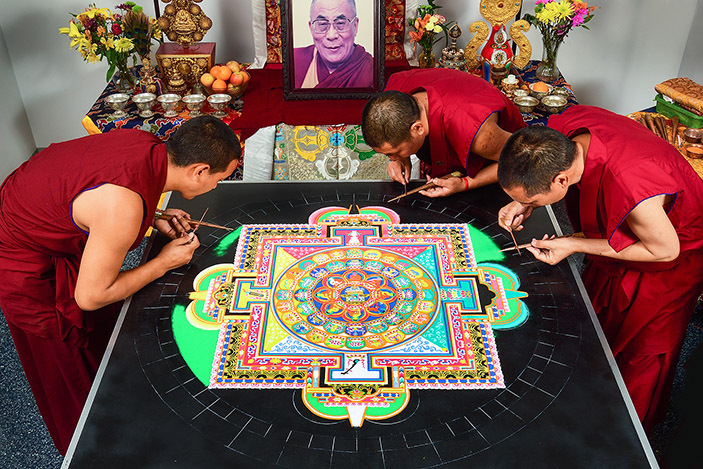 Upon completion of the sand mandala at Emory University Hospital, the artwork was ritualistically dismantled by the monks, placing the sand in various tributaries of water where it was released back into nature.